Valentine's Summary: Bryson and I were in Cedar City on Valentine's Day morning. We intended to stay down in Cedar through the weekend until Tuesday because Mike was leaving town (to help his grandparents move) and everyone knows it's no fun to be alone on Valentine's. But Mike's plans got moved back a day, which meant he was still home on Valentine's and I was still in Cedar. 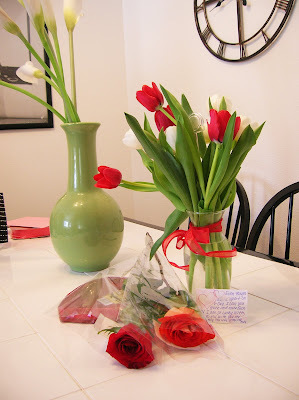 He was so sweet and sent me a cute little vase of tulips with a poem. Abbel was so sweet and gave me a box of chocolates and a rose to help me feel better about being without my love on Valentine's. After getting Mike's flowers and realizing he was still home, I started missing him dreadfully and decided to surprise him by driving home so that we could spend Valentine's evening together. It was so much fun to surprise him! We ended up ordering take-out from our favorite Chinese restaurant China Lily, rented a movie, and enjoyed a romantic low-key Valentine's evening together. I love my Mikey!